my gadfly priggishness incessantly resounds its sullen voice. Now intoxicated by caffeine, I begin to settle on a lazy chair. My perception is obscured as I wathced the streams of tiny metal boxes flow along the brambly circuits of parched cement. an ugly bearing of the immanet reality of the burgeoning post-modernization. yet inchoate, ever becoming but never being. Hope you're keeping dry. Yesterday, while everyone rushed out of the office building, I decided to pursue my photo walk at my one favorite hang outs: the district roof top. I don't know if it was because I wanted to get home quick and I was hungry but the skyline looked like ham and eggs to me. The sunset in the Southland is arguably one of most peculiar ones around. I think this is one example. I like it when the sun is hiding behind the clouds. The light spills looked like melted egg yolk squeezing out under a smoke ham. I think I have a weird imagination. This was taken using the Canon DLSR 60d and the 100mm Carl Zeiss Makro. On a small monitor, I think there is not much quality difference with that produced from my Point and Shoot. Does that mean I overpaid for my DLSR and Carl Zeiss lens? SWIL: The pic is better quality than the P&S ... I think the quality lens was worth it. As far as your imagination ... very creative indeed. Glenn: Looks like the eggs were sunny side up! Anna: Now I'm hungry! Great shot. Lisa: Cool but.... I don't see the ham and eggs. That must have been your stomach thinking for you. R: I wonder sometimes, if I overpaid for my camera. I might be able to take better photos with a point and shoot. This was a beautiful shot you took! I saw the beautiful sunset, I wanted to go home and grab my camera, but as quickly as the sun was setting behind the clouds the moon shown through the white misty clouds. The perfect scene for Dracula or the Wolfman. Juzno: Hey R... I was merely being facetious when I commented about my pricy camera. As for me, I don’t have regrets for the stuff I own and use. I don’t think you can find a camera that’s a one size fits all. I still like my DLSRs for the image quality and reliability. My P&S works well when I want to carry a bang up camera not fearing that it will be stolen or banged up. I still like my film cameras because it gives me a different thrill when I take pictures with them. And yes, I still like my homemade pinhole camera that’s all taped up and falling apart. I love the blurry lo-fi quality it gives me. So, no I don’t think you would be better off with a P&S. I think you just need to use your camera more often. BTW, the night image shot with the P&S that I sent you yesterday took a long time to set up, and I have to spend hours in post processing to get it to look the way it did. The image today only took minutes to set up and there was not much post processing. So, there really is no comparison. Sorry, if my comment made you second guess yourself. Just keep working at it. My one repeated suggestion: Bring your camera every day. Use it. Don’t worry if the images are all botched as you can erase them later. S: OK – I’m not quite getting the Ham and Eggs feeling on this one but beautiful picture! 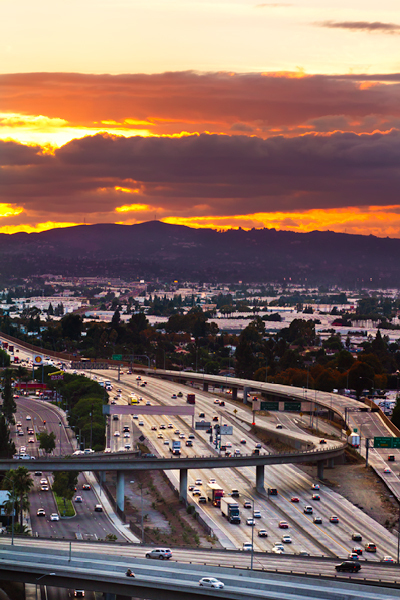 The busy freeway against the calm of the sunset – they complement each other. Hey, I think that’s my car down there - I’m leaning out the window taking a picture of you on the roof...!